Luotuowan Pergola's undulating geodesic canopy has been made by LUO Studio from wooden beams salvaged during the renovation of Luotuowan village in China. Chinese architecture firm LUO Studio used timber struts discarded during the village's renovation works to create a geodesic tunnel that serves as a sheltered community gathering space. Like many parts of rural China, the settlement in Hebei Province suffered a period of decline and neglect in recent decades, as the country's focus shifted towards its expanding metropolises. Luotuowan village has struggled particularly due to poor transportation connections with its setting at the foot of the Taihang Mountains. As a result of its economic decline, an increasing number of the village's houses had become dilapidated. A recent programme of investment by the local government aimed at improving conditions in the village provided funds for new construction and the renovation of existing houses. Villagers with homes in need of re-roofing were offered the choice between a traditional wooden roof or a contemporary concrete alternative. A majority opted for the concrete option as it was more affordable and simpler to install, which led to a large number of wooden beams and rafters being removed from these properties and discarded. Alongside the investment in housing, a series of improvements to infrastructure and public space were proposed as part of the village's renewal. One of these interventions involved the installation of a pergola to provide a shaded gathering space atop an existing escarpment built to negotiate a change in level within the village. Rather than following the original plan for a steel-and-timber truss structure, which would have involved transporting materials from distant suppliers to the site and necessitated a specialist construction team, LUO Studio's design used the village's discarded timber. The architecture studio was influenced by the principles developed by American engineer Richard Buckminster Fuller, who used the word "dymaxion" to describe his pursuit of "maximum gain of advantage from minimal energy input". In the case of the pergola, Buckminster Fuller's concept of geodesic structures, which are created using a framework of triangular elements, was used to develop a rigid form using a minimal volume of materials. "The design philosophy of 'dymaxion' actually resonates with the concept of rural construction," LUO Studio said in its statement. "Many Chinese villages present a unique built landscape, which was created by generations of villagers who had the wisdom to make use of local materials and maximise functions with minimal input." 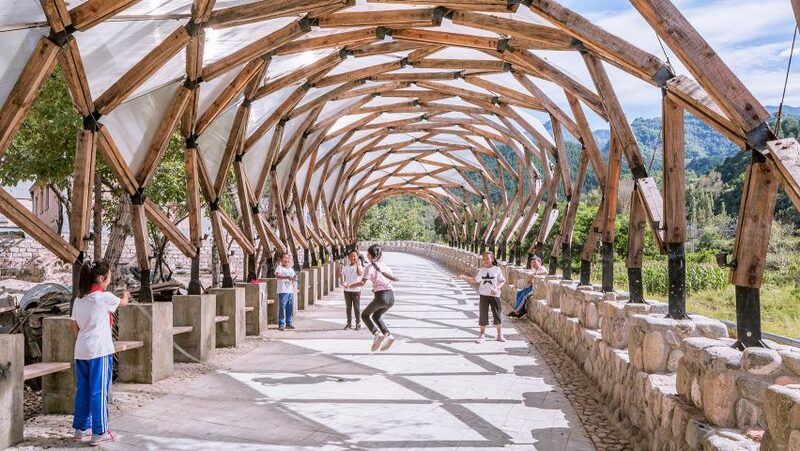 Luotuowan Pergola was constructed using pieces of the leftover timber that are as small as possible and enabled the villagers to erect the structure themselves. The geodesic framework provides optimal stability whilst achieving a column-free covered space, with the structure anchored in the existing wall and a row of concrete pillars on the opposite side of a path. In addition to reducing the volume of material required, the efficiency of the design helped to reduce the cost of the project. The wood used for Luotuowan Pergola was salvaged from properties of varying widths, so pieces were different lengths. By retaining the original length of the timber beams, the architects created a pavilion with an undulating roofline that references the outline of the surrounding mountains. The triangulated framework is held together by custom-welded metal fixings and steel tensioning cables. Translucent plastic panels slotted into the gaps between the structural elements form a canopy that offers protection from the sun and rain. LUO Studio also used wood to create tree-shaped structural columns at a real-estate sales centre in Puyang County, which can be adapted and dismantled in the future. Photography is by Jin Weiqi.